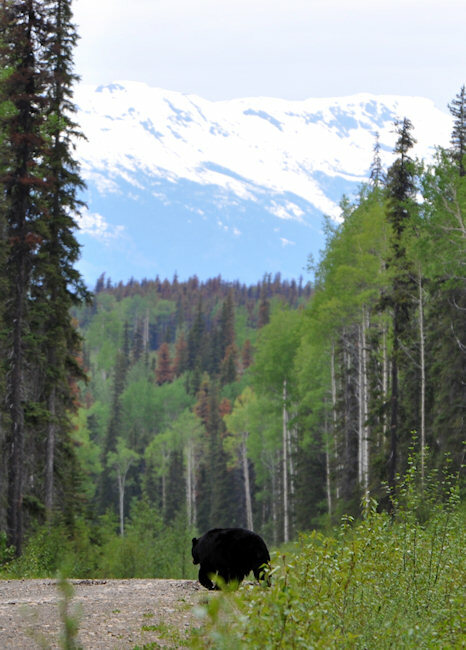 Spring black bear hunting starts in mid May and runs until the end of June, when the bear's coats are in prime condition. 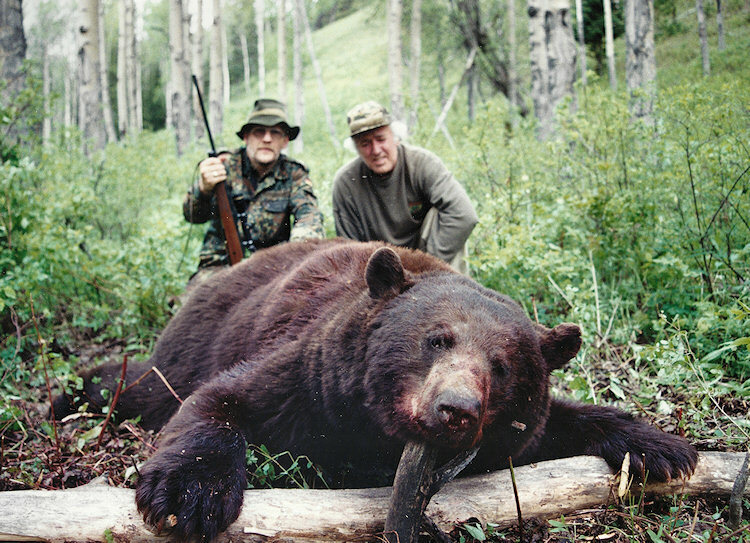 The bears range in size from 6' to 7 ½’. Losing up to 1/3 of their body weight over the winter, these bears can still weigh as much as 400 lbs. 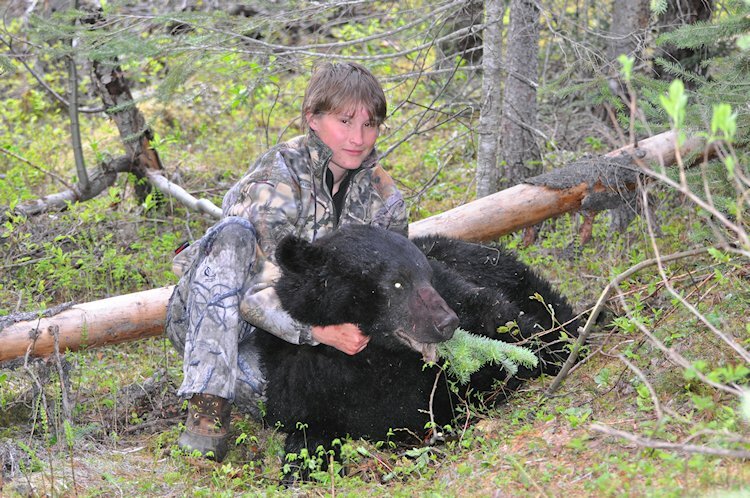 Success on the spring bear hunts is typically 100%. The hunts from our Babine Lake camp also offer fantastic fishing at this time of year for big rainbow and lake trout. 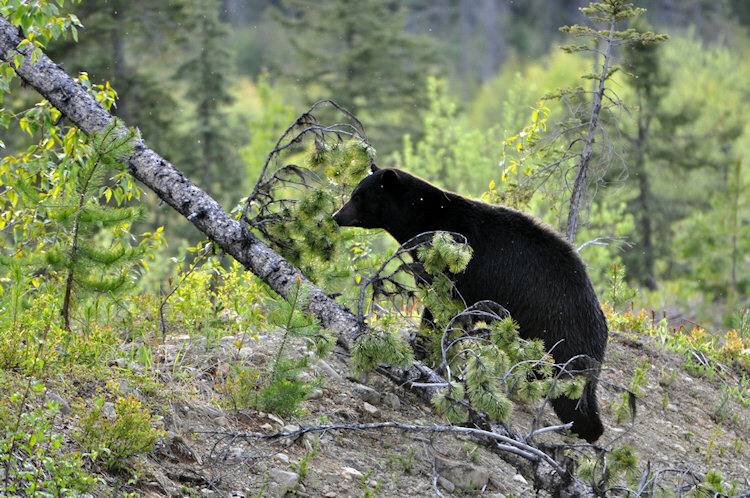 In the spring the bears can be seen feeding on the fresh green grass in the various logging blocks and roads of Northern BC. It is these clear cuts and side roads that green up first in May & June. 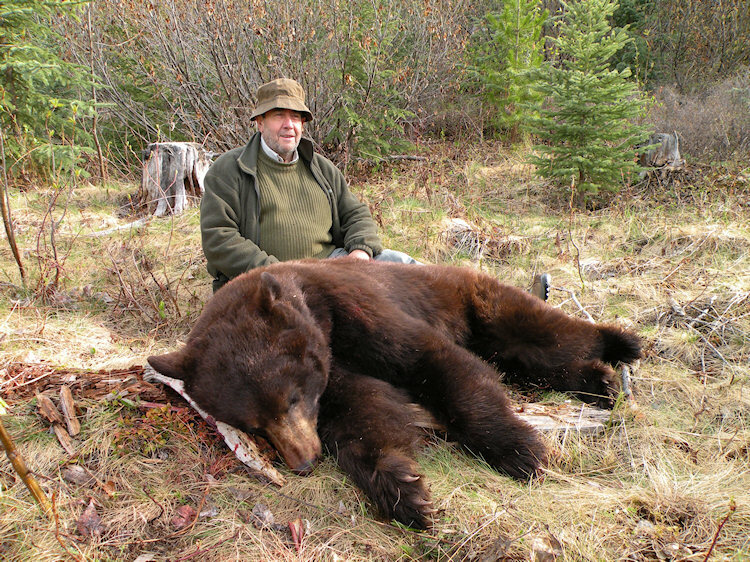 The bear hunts are done from ATV, a pick-up or by walking. 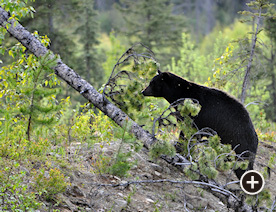 It is not uncommon to see more than 20 to 40 bears on your 6-day hunt. 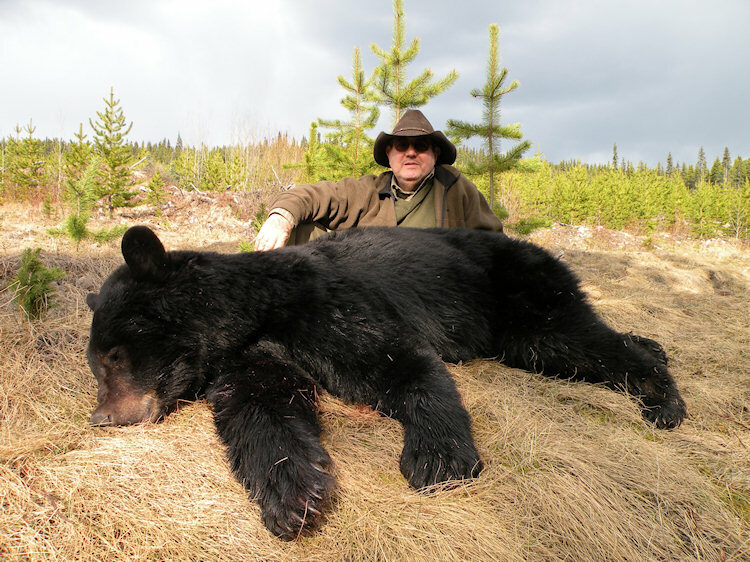 We have two great locations with a tremendous number of big bears. These parts of our area have not been hunted much in the past decade. The Babine Lake Camp is accessible by road from Prince George, British Columbia, Canada. After one night at the Hotel in Prince George we will pick you up and make the 5 to 6 hour journey to Babine Lake Camp. This camp used to be an old homestead and has some great log buildings serving us as a cook house, guest cabin and guide quarters. There even is a nice hot shower setup waiting after a long day of stalking bears. The roads, side roads and logged areas offer some first class bear hunting for rifle or bow hunters. Most black bears are black but some are chocolate or red-brown in color. If you get your bear early you can keep hunting with your camera or take one of our boats and experience some great trout fishing. At the end of your trip we bring you back to Prince George where you will have one more night at a nice Hotel before your journey home. There are many daily flights to and from Vancouver making your travel quite easy. The Sustut River Camp is a remote fly-in location accessed by charter wheel plane right from Smithers Airport. Your destination therefore is Smithers via Vancouver. Hawk Air and Air Canada both have regular flights in to Smithers. After one night at a Hotel you will be brought to the airport to get you flown in to this part of our area. From here we hunt with ATVs on a fully developed road system with logged cut blocks that provide fantastic habitat for large bears. We also hunt on foot and by glassing old burns and open hills. The Sustut River Camp hunt costs an additional $1100/ person for the charter plane cost. Accommodation up here for the spring bear hunts is the famous Steelhead Valhalla Lodge. Included: Included is all ground transportation, accommodations and meals in the area during the hunt. Also included are one Black Bear and any Wolves. Not included: Hunting License $180, Black Bear $180, Wolf each $50, Fishing License $89, Hunter Preservation Fund $200, CITES $30, charter flight to the Sustut River camp $1100, Taxes.